If you see an error after you've paid, don't buy another ticket. Sit tight. We can almost always fix the problem. One of the team will be in touch with you soon. What is a checkout error? What causes a checkout error? Sometimes, there's a problem with a rail operator's system at checkout, right at the point of purchase. We call these "checkout errors" and we take them very seriously. This is the most common cause of a checkout error and it is easily fixed. Our software will automatically try to download your tickets again. In most cases, this works and your tickets will be sent by email after a few minutes. Sometimes, tickets which appeared to be available disappear at the last moment. We'll try to rebook your tickets manually and get in touch with you soon. In all cases, we've been alerted to the problem. One of the team will be in touch with you soon. 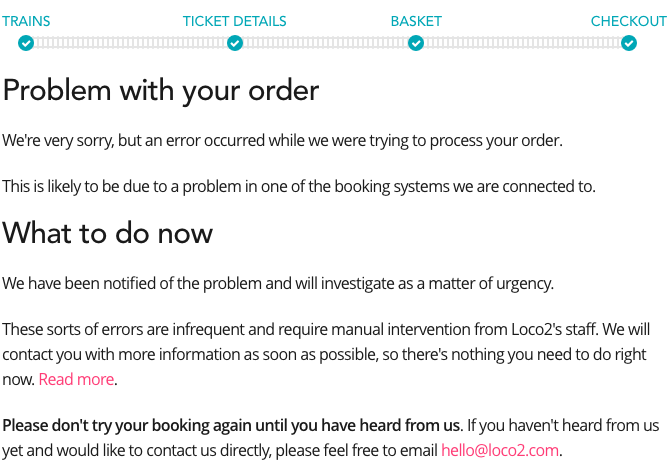 Don't buy new tickets, either on Loco2 or elsewhere. We can almost always confirm the booking and send your tickets. We've been notified so you don't need to do anything (checkout errors trigger an automatic alert to the team). You will receive an automatic email which confirms that we have been notified. You can reply to that if you want to, or wait to hear from us. Check your inbox. Sometimes, it's fixed very quickly and you'll find that the tickets arrive after a few minutes. If the tickets don't arrive after a few minutes, a member of us will be in touch as soon as possible, including on weekends. If it's late at night or you are using the site from outside Europe, you'll hear from us in a few hours.